Glass doors and damper in fireplaces allow you to enjoy the sight of the merrily burning fire and not suffer from smoke and smell. But glass has the ability to quickly become covered with soot, the door becomes turbid, dark, or even black, with a thick layer of soot not umuvuduko. There are special tools for cleaning the glass from the fireplace, you can also use regular cleaning products or other ways. How to clean up soot? Glass doors can have a different degree of contamination. If you constantly keep track of their purity, they will only be covered by a small layer of soot, which is easier to remove than solid fat deposits. The soot is easily washed crumpled and dampened Newspapers, rags of cloth, moistened with any cleaning solution or wash floors or dishes. Experienced owners suggest of fireplaces to clean the glass from soot ashes of the same fire: sprinkle ash on damp cloth or newspaper and thoroughly clean the entire surface. Also from soot help sprays and other products specifically designed for cleaning fireplace glass, they are sold in DIY stores and specialized departments for the sale of fireplaces. Suffice it once a week to wipe the door with this solution to keep clean the fireplace. How to clean up hard carbon deposits? It is much harder to deal with the layer of solid carbon deposits accumulated over a longer period. It is best to use special tools for a fireplace or for cleaning ovens. Be careful to use them, be sure to wear rubber gloves. The solution is applied to the glass and leave for some time then wash off. Suitable means for cleaning microwave ovens, ceramic surfaces, and any cleaners with acid. In any case it is impossible to use abrasive means for the cleaning of soot, such as metal sponges, or try to clean the soot with a knife blade as it can damage glass and to leave scratches. If you can not use a cleaner, can make cleaning solution for soot in a glass of vinegar add a teaspoon of liquid soap and apply this mixture with a cloth onto the glass. A good way of dealing with the soot to burn in the fireplace many dry conifer firewood in the open on the high of the podduvalom to improve traction. After all will burn, it will be enough to wipe with a cloth the glass. This tool may not help, if the soot layer is thick and old. After cleaning the fireplace before the first use, put on the wood a handful of salt, this will help to reduce the amount of soot. 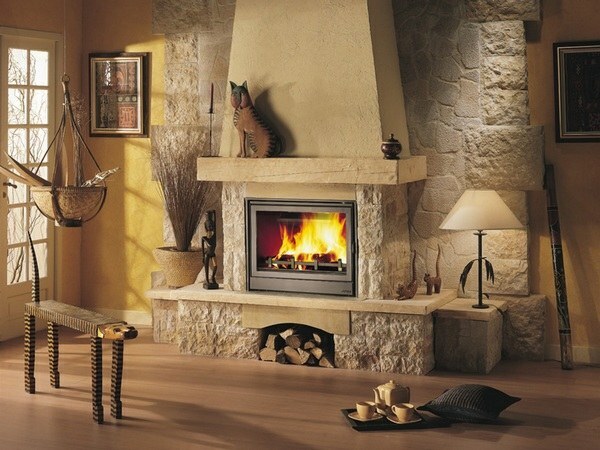 To prevent the appearance of severe fouling, it is necessary once a week with regular use of the fireplace to wipe the door, burn only dry wood, not to use the birch – she smokes heavily. Wet wood not only contribute to the deposition of soot on the doors, but also dangerous, in the chimney accumulated soot can catch fire.